I am working with American Express to redo my bedroom. This week they have provided me with 150,000 Membership Rewards points. The books in our bedroom doth overflow. We filled our library bookshelves long ago, and now the books are starting to amass into random piles throughout our home. We are planning to donate some of our books to the library, but we could still use more storage for the volumes we intend to keep. Our bedroom is somewhat small (12’x12′) and with a queen size bed, two nightstands, and my freestanding wardrobe, there isn’t a lot of room left for other furniture. There is a small space between the door and the closet though, and I found a bookshelf console table that fits perfectly. I’ve already redeemed some of this week’s points and I can’t wait to get the bookshelf in the room so I can put our books away. 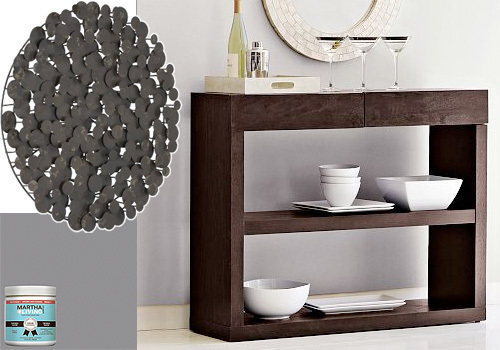 I was considering placing a mirror over the bookshelf, but I’m going to use a metal wall sculpture instead. Also, Brandon and I have decided that we are going to go ahead and paint the room in Martha Stewart’s ‘Zinc’. So we’ll have art with an antiqued zinc piece on a wall painted in ‘zinc’; I don’t know why I like that so much, but I find it charming. We have this exact same problem in our house – our library shelves are full, we still have boxes of books and no place to put them, and the books in our bedroom – well, let’s just say they aren’t in neat little piles like yours…ours look more like an avalanche hit. I love your solution – can’t wait to see how the new shelf/console looks in your bedroom. I recently painted my guest bedroom in this Martha Stewart color. I LOVE it! It makes me want to move into this room. I may have to paint the master bedroom with another Martha Stewart selection. The colors look so good. I am enjoying following you on this journey to decorating the bedroom. You give me the motivation to update my home. I’m doing the same thing in my bedroom in re books. I know this sounds odd, but I have to read something every night before I go to bed. It’s how I unwind. Anyway, when I don’t have something good to read, or when I am too tired to read something new (don’t ask why I just don’t go to sleep) there are a dozen or so books that I have on hand to flip through. I reread favorite sections, go back over parts I didn’t completely understand, or try to find something new I might have missed or forgotten. I have no idea why I wrote that all out (perhaps b/c I was up until 1am re-reading?) but what I wanted to say is that (1) I think it’s a great idea, (2) something I am also doing, (3) chuckling over the fact that your bedroom is going to end up as dark and cozy as your library. It will be another book haven, but with a bed! This room is going to be fabulous! I love everything so far. On a different note…since it appears you are an avid reader, I would love to hear your top ten must-reads. Whew, that is a tough question to answer! I do like Eugenides a LOT, and I’m a big fan of Russian lit. If you’re a fan of Russian lit, then you’ve probably read Anton Chekhov’s short stories? He wrote one of the most gruesome, scariest stories I have ever read. It was pretty awesome. eeek! love! can’t wait to see it all finished! I love the look of books upon books in a nice shelf. Can’t wait to see how it all pulls together. I really like the color of the paint. Would not have thought of it! I’m looking forward to seeing it pulled together. Your eye for design is just amazing. I haven’t commented much lately because work has been so busy, but I’ve been keeping up and love what you’ve done so far! I especially think all of the bedding is fantastic. ooo…I think the color will work so well with the edison light fixture! Are you doing the ceiling and trim white? White trim, gray ceiling. I think the darker color will look good with the fixture! I love the idea of the white trim with gray ceiling. Right now my beedroom is completely white, so I think this is going to be a great inspiration. Before you donate your books to the library, make sure your library wants them! I work in a public library and most of the donations we get end up in our recycling bin because they are either (1) old, (2) in poor condition, or (3) we already have one or more copies of said book. We are constantly dealing with boxes of books that people drop off thinking they’re doing us a favor. I’d recommend either having a garage sale or donating the books to a community resource that actually can use them. The library here holds a book sale yearly, so the books we donate would probably go to that (not the shelves of the library). I should check before we bring boxes and boxes of books though – thanks for the reminder. I work at a charter middle school, and we are constantly looking for new books to stock our classroom libraries with to help our students find their next “just right” book and fall in love with reading. School budgets are taking a huge hit this year. I bet there are a ton of schools who would love to take unwanted books off of your hands. Just something to think about as you are boxing up that donation box. I love your bedroom plans, by the way! I’m excited to see the new light you’ve picked out in the space. I was eying it in the catalog and thinking about where it might work in our house. I am really surprised your bedding is already on. When I re do I have to wait until everything is together before I assemble. For some reason it feels newer that way. I am an avid reader as well and there are books not just piled in my bedroom but everywhere in my house! I am out of shelf room! I think I am going to build one myself though. There is a pattern at http://www.knock-offwood.com/ that I really like! Good luck! I can’t wait to see the finished product! I just got rid of a ton of books when we converted our office into a new nursery. I sold them online through Powell Books. You type in the ISBN number and they give you a price – much lower than you paid but it is something. They also pay for the shipping. After they receive it they send you the $$ through PayPal. It’s a good way to make some cash if you are interested. The room is going to look great! Never enough room for all the books, unless you live in a pre-war Parisian flat. When I lived in NYC, where space is a premium and most furniture has to serve double duty, I came up with what I thought was an ingenious solution. 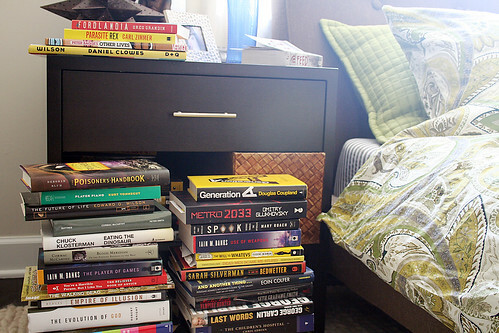 I stacked over-sized books about 20-24″ high and put a decorative tray on top: instant side table. For an instant coffee table, I would do the same thing, except the stacks were only about 16″ high and I would push a few stacks close together and used a larger tray. I am right in the middle of a bedroom makeover too! I love your choice of paint color. I recently repainted my bedroom a similar shade (Valspar- London Coach). Pair that with crisp white trim and soon to be added crown molding I think it’s the perfect backdrop. I would LOVE (if you have time) to see you post about bed side table options that include storage! Currently we are using two vintage sewing tables (lovely cherry wood) but we are ready to upgrade! And we have so many books in the bedroom that I think we may need two full size bookcases. We have two walk in closets so we don’t need to have dressers in the room. Thanks for continuing to be a inspirational source for me! We just painted our bedroom with Behr’s Elephant Skin and I love it. It’s a little dark in there now but I think that’s the way I like the bedroom. I love Martha Stewart’s paint colors. I tend to sell books on ebay after I read them unless I really like them. Really looking forward to how this turns out. I’m re-painting our master later this summer; I know I want gray but haven’t picked the paint yet. Your room seems to get a lot of light, as does mine, so I may just be copying you! I also have to read right before sleep. When I don’t, I just toss & turn and end up turning on the light to ready, anyway. Nice console bookshelf! I wonder if it might look even better on little feet (something from Ikea or similar)? I just saw this necklace and I thought it’s very “you”, hahaha. Creepy? Don’t books just make the prettiest decoration? I really love that bookshelf – and they’ll be at arms reach to read before bed, love that! I cannot wait to see the after photo of your wall color. I fell in love immediately with Martha Stewart’s Zinc the other day when I was standing there picking one of each swatch at my local Home Depot. I’m currently working on a post in regards to my bookcase solution…should be up shortly. Great job!!! we have so many books, i hardly know what to do with them! that wooden console would definitely help the crazy book clutter. Love the color chosen to paint. Will go very well well with dark furnishings. keep mirror with the sculpture seated on the shelf. Will create a lot of depth. My husband & I both read in bed every night, so we have navigated the “stacks” in our room for years. In the past, my round tables beside the bed have been especially dangerous. Recently I was looking to replace my nightstands. I thought maybe something w/ a drawer and then a shelf below (similar to what you appear to have currently). I didn’t have a large budget, so I decided to use two small Expedit bookcases from IKEA. The plan was to use them temporarily until I could afford something nicer (and then transfer them to the playroom). I got the brown/black and used a white Expedit drawer insert in the top corners closest to the bed. I use the drawers for lotions, etc… We’ve actually loved having the other 3 sections for books. It’s been a practical, cheap, and decent-looking solution. I like a tall nightstand, so the 31″ height is perfect and exactly the same height as our bed. The tops are deep enough to accommodate a reading lamp! Looking forward to seeing your completed room!